The construction of Fanatic's Fly Air boards using this technology use the best Drop-stitch materials in the market. It is through this V-Drop Stitch core that the base of Fanatic's inflatable boards are made. V-Drop-Stitch is a durable PVC canvas. This novel material used in the making of Fanatic's Fly Air technology consists of thousands of threads that link together the top and bottom parts of the SUP board and keep at all times its shape, form and rigidity. This type of construction allows more air inside, thus more pressure and rigidity in an inflatable board, bringing it on par with a regular rigid SUP board. 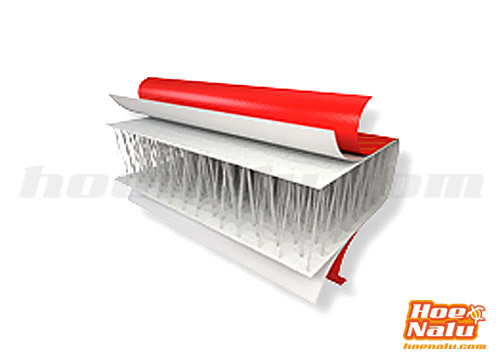 It is important to mention the PVC central reinforcement which is the reason for the name, Stringer, as it goes through all the board from nose to tail. It also features PVC reinforcements around the edges and an upper anti-slip Diamond Groove around 3/4 of the deck. 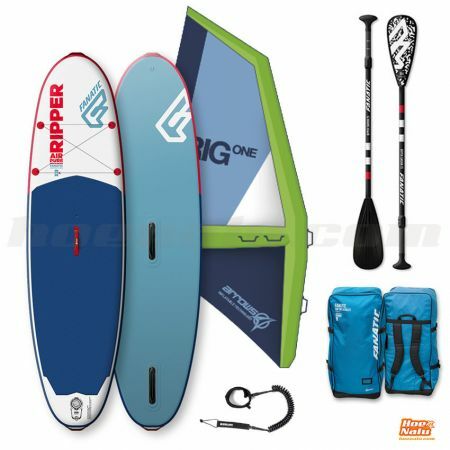 Fanatic SUP Fly Air Premium 10'8"